The Sonoma Coast AVA extends from San Pablo Bay to the border with Mendocino County. The appellation is known for its cool climate and high rainfall relative to other parts of Sonoma County. Close to the Pacific, with more than twice the annual rainfall of its inland neighbors, it’s warm enough to ripen wine grapes because most vineyards are above the fog line. Much of Sonoma County’s most celebrated Pinot Noir and Chardonnay are grown here, yet few wines are actually made in the Sonoma Coast AVA, and several of its most distinctive sub-regions are not officially recognized AVAs. Some of California’s highest scoring and most coveted cool-climate style wines are grown in the Sonoma Coast AVA. It includes about 2,000 vineyard acres, and fewer than 10 wineries (not counting wineries that belong to overlapping appellations such as the Russian River Valley). Burgundian varietals Pinot Noir and Chardonnay star in this cool-climate appellation. Syrah is an exciting runner-up. Varietals grown within the crossover appellations are rarely labeled as Sonoma Coast. The West Sonoma Coast, part of Sonoma County, has distinguished itself as one of the world’s leading regions for top quality Pinot Noir and Chardonnay. It contains many distinct growing areas including Annapolis, Fort Ross/Seaview, Occidental, Freestone, Green Valley and the Sebastopol Hills. Nearly four dozen wineries make wines from vineyards that hug Sonoma’s coastline. A family one acre site, Halleck Vineyard is perched above the Russian River watershed and flanked on the west by the slopes to the Pacific Ocean. It commands an expansive view of the rolling Sonoma County hills to the northeast. 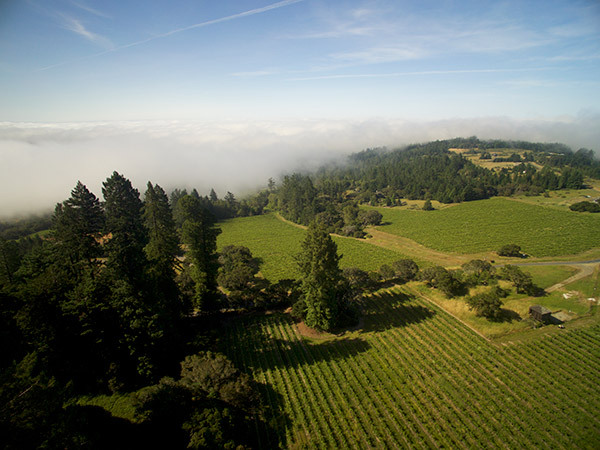 At 900 feet, it is one of the highest vineyards in Sonoma County. Planted to encircle the Burnside home, the vineyard faces the west and the north. During the second half of the growing season, coastal fog invades the landscape every afternoon and on rare days, the sun only peeks through. This cool weather allows the fruit to mature slowly and the flavors to intensify. Our Indian summer heat in late September through October spikes the ripening and sugar levels at the last moment for perfect harvest conditions. Hartford Wines Far Coast Vineyard is a cool site surrounded by redwood forests, almost two hours north of the Russian River on a Sonoma Coast mountain ridge. Our Land’s Edge Pinot Noir is sourced from two Estate owned Vineyards: our Far Coast Vineyard (just south of the town of Annapolis) and our Estate owned Seascape Vineyard (west of the town of Occidental). The name Land’s Edge is derived from the fact that the Vineyards are located high on the Sonoma Coastal Ridges that run along the Sonoma Coast’s land’s edge and the Pacific Ocean. Seascape Vineyard sits on a panoramic site on a scenic ridge-top west of Occidental, California in the Sonoma Coast AVA. The vineyard abuts an old redwood grove and faces cascading ridges to Bodega Bay and the Pacific Ocean. Red Car vineyards on the edge of the Pacific. Vineyard flavors are consistent, specific and repeated year after year, varying only with the weather in which the grapes ripened. When a vineyard is worthy of distinction, it speaks with remarkable articulation, complexity and harmony and one can taste its worthiness immediately. After several years of working tirelessly with these remarkable sites, we can say with confidence that they are unique and deserving of our attention. All of the fruit for our Heaven & Earth Pinot Noir has been grown on a 4.5 acre site less than one mile northwest of Occidental. The Hagan Vineyard perches high above the edge of the continent fully facing the cold Pacific Ocean on the esteemed Taylor Lane west of Occidental. Carved out of the lows hills above Freestone, a tiny village on the West Sonoma Coast, sits the seven acre vineyard known as Zephyr Farms. Doc’s Ranch vineyard is organically farmed micro-vineyard of just 1.3 acres is nestled among coastal redwoods west of the hamlet of Occidental. Plat Vineyards. On the outer reaches of the viticultural frontier, this groundbreaking vineyard overlooking the Bodega Valley follows in the footsteps of its legendary namesake, Lou Platt. Sonoma Coast Vineyards handcrafts wines from a unique cold-climate growing area west of the Russian River Valley and a mere five miles from the Pacific Ocean. SCV works closely with this small group of ambitious growers in partnership efforts, including Jack and Kathy Balistreri of Balistrieri Family Vineyards, Will and Diane Petersen of Petersen Vineyard among others. SCV's focus is cold-climate viticulture that encourages the full expression of Pinot Noir and Chardonnay not seen in warmer regions. We have pioneered and are crafting uniquely-styled Sauvignon Blanc and Syrah highlighting the distinctive characteristics of the Sonoma Coast. The long, cold growing season typically results in our harvesting well into late October and early November. The result is fruit of intense complexity with high levels of natural acidity. Furthermore wines sources Sonoma Coast grapes from Nevina's Vineyard, Gap's Crown, Gioia, Eden and Star Bridge. Their Nevina's Vineyard estate vineyard outside of Occidental is less than 6 miles from the ocean at an elevation of 1,300 feet. Planted in 2002 with 777 Dijon clones by Sonoma Coast pinot pioneer Scott Zeller.